Cross-laminated timber, CLT, explains the expansion of multi-storey wood buildings in the world. Gerhard Schickhofer is awarded the 2019 Marcus Wallenberg Prize for research and knowledge transfer behind the stable and eco-friendly material. Professor Gerhard Schickhofer, the Institute of Timber Engineering and Wood Technology at Graz University of Technology, Austria, has laid the scientific and technological foundation for the development of cross-laminated timber, CLT. For his discoveries he is awarded the 2019 Marcus Wallenberg Prize of SEK 2 million. Cross-laminated timber, CLT, consists of several layers of solid wood laminations glued together crosswise measuring a length of up to 20 metres, a width of four meters and a thickness desired for every purpose. The elements are stable and load-bearing. They are also easy to process, shape and even curve using modern manufacturing technologies. All these qualities have made wooden skyscrapers possible. Many projects around the world are competing in constructing the world’s tallest buildings in wood. Brock Commons, an 18-storey student residence in Vancouver, Canada, has kept the lead after being completed in 2017. It was however recently reported that the first tenants will move in to HoHo tower in Vienna, Austria, in June 2019. The 24 floors will house apartments, offices and a hotel, a restaurant and a gym. Even higher so called plyscrapers have been proposed in several countries. The 80-storey River Beech Tower in Chicago, USA, is among the tallest. Gerhard Schickhofer and his research team have played a leading role in establishing European standards and Technical Approvals for CLT production and use in industrial applications of wood construction. CLT has radically transformed the view on construction and design in the wood building industry. Its orthogonal, laminar structure allows applications as full-size walls and floor elements as well as linear timber elements able to bear heavy loads. Prefabrication of different modules at the factory makes the assembly time on the building site shorter. Conifers such as spruce, larch or pine, but also deciduous species such as birch, ash and beech, can be used in the engineered panels. Since the layers of solid wood are glued together longitudinally and transversely the elements are less affected by changes in dimension due to humidity fluctuation. Buildings made of CLT are characterised by slender wall constructions and high loadbearing capacity. They provide excellent performance with regards to fire safety and impact of earthquakes. CLT is like solid wood a sustainable and renewable material. It preserves the environment due to its ability to store carbon dioxide and substitutes for example concrete and steel as building material – both resulting in large carbon dioxide emissions when produced. 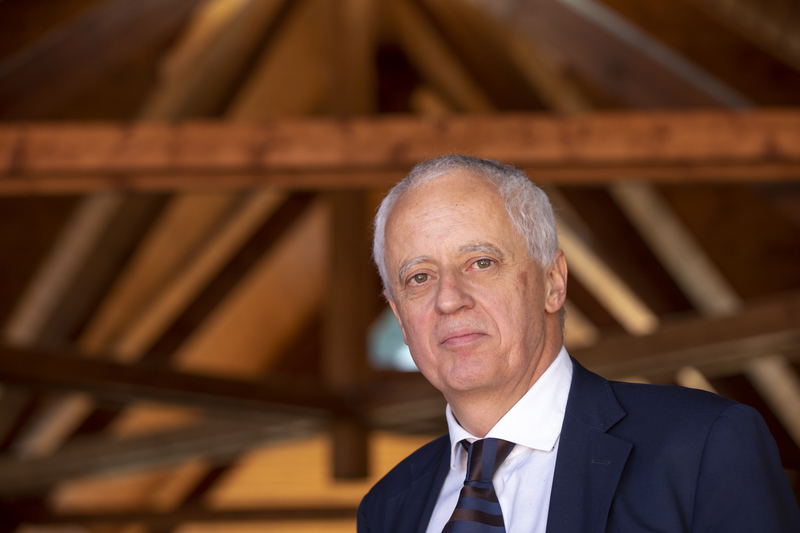 The Prize Selection Committee of the Marcus Wallenberg Foundation states in its motivation that Gerhard Schickhofer has made scientific and engineering contributions required to standardize the development of CLT and enable its adoption as a building material. Gerhard Schickhofer has also succeeded in transferring scientific knowledge to practical applications. His user-friendly software tools and handbooks have had a great influence in the field. The Institute of Timber Engineering and Wood Technology and the Competence Centre at the University of Technology in Graz also stand out by their application-oriented research. Both organisations provide the industry with technical support, testing and training. – Gerhard Schickhofer’s passion and commitment to the field of CLT have played a key role in raising the profile of wood for the construction of massive and tall structures. His work has been seminal in interpreting the technological opportunities of CLT to architects and designers, says professor Johanna Buchert, chairperson of the Selection Committee. The 2019 Marcus Wallenberg Prize will be presented by HM the King of Sweden to Gerhard Schickhofer at a ceremony in Stockholm in October this year. Gerhard Schickhofer was born in Vorau in Austria in 1962. In 1994 he presented his PhD thesis on “Starrer und nachgiebiger Verbund bei geschichteten, flächenhaften Holzstrukturen” at Graz University of Technology. For this work he received in 1995 the Josef-Umdasch Award from an international group of wood and metal businesses based in Austria. A scientific compilation of his work was published in 1996 with the title “Elastic Analysis of Flexibly Jointed Laminated Timber Plates”. Gerhard Schickhofer received the Austrian Industrial Research Promotion Fund award in 1998 for his work on the first Austrian approval of CLT. Due to his contributions the first national guideline on CLT, the so-called Holzmassivbauweise, was published in 2002 and led to the acceptance of the engineered elements in multi-storey buildings. Gerhard Schickhofer was appointed Professor and Head of the Institute of Timber Engineering and Wood Technology at Graz University of Technology in 2004. Together with Reinhard Brandner he recently summarised the contributions of the Graz group in the publication “Cross laminated timber, CLT: Overview and development”. Prof. Gerhard Schickhofer, TU Graz, Austria, is awarded the 2019 Marcus Wallenberg Prize. Photo: Helmut Lunghammer @ Lunghammer – TU Graz.